You asked for it, and you got it. In our continuing celebration of the New Order's first birthday, we have a very special "Kills of the Week" post today. The following are the most expensive kills from the previous "Kills of the Week" editions in these categories: Retriever, Mackinaw, Hulk, Capsule, and Orca. Oh, and I suppose I'll toss in a few of my favorite wildcards, as well! 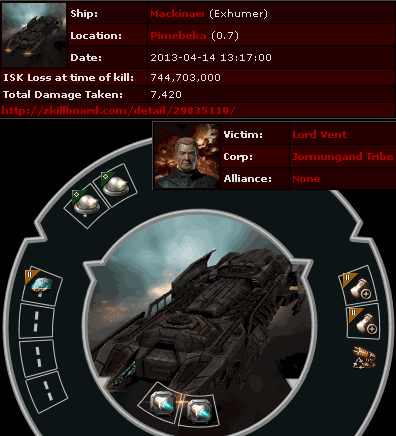 Here's Lord Vent's 744 million isk Mackinaw, killed by Agents Ziaeon, Lady Geesica Marstolt, and PinkOboe. The ORE Strip Miners equipped to the ship vary in price over time. 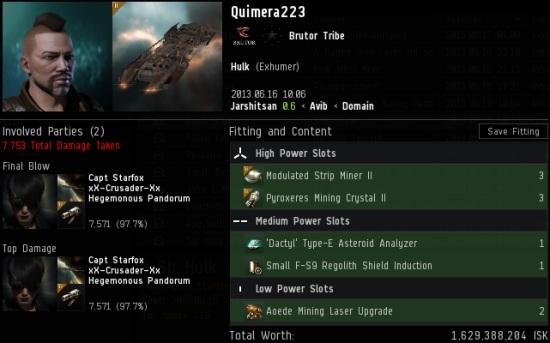 At current prices the Mack would be worth over a billion isk. But flying a completely untanked mining ship (indeed, anti-tanked) never seems to go out of style with these carebears. 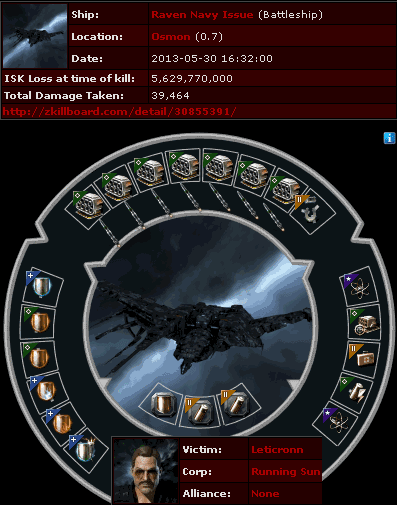 Next up, Quimera223's 1.6 billion isk Hulk, killed by Agent Capt Starfox. Quimera didn't bother to fit any tanking rigs to this piñata, which also featured two empty midslots. I'm sure it was all he could do to equip one shield extender--even if it was a small. 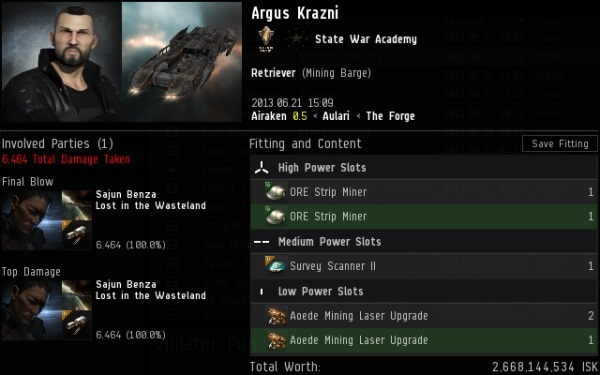 This one will come as no surprise: Argus Krazni's now famous 2.6 billion isk Retriever, killed by Agent Sajun Benza. Eve-Kill.net values the ship at 2.09 billion or 2.37 billion, depending on the market. Regardless, Argus is a legend. I'll always treasure this kill and the wonderful Code that made it possible. 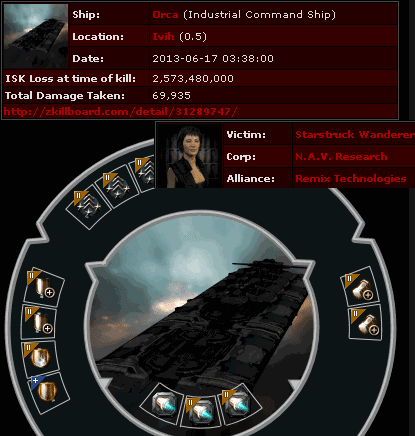 Of all the Orcas we've destroyed, the most expensive belonged to Starstruck Wanderer, who lost 2.5 billion isk. Agents Capt Starfox, Dante Lobos, Ziaeon, xxBLACK SKULLxx 929, D400, Maiki Dresin, Pestario Vargas, Sir Mack Inawrex, and Agent Trask did the deed. Perhaps my favorite of the changes CCP made to the game in the last year is the addition of corporate and ship hangar data to Orca killmails. If you stuff your Orca like a pot pie, you deserve to get popped. The priciest of the pods, worth 3.8 billion isk, belonged to Argus Tuffed, 'sploded by Agent Karbox Delacroix. I'd just like to point something out that may have gone unnoticed: The most expensive Hulk, Retriever, and Capsule kills on this list were all solo kills. One person in one ship can make a difference. This is solo PvP at its very finest. 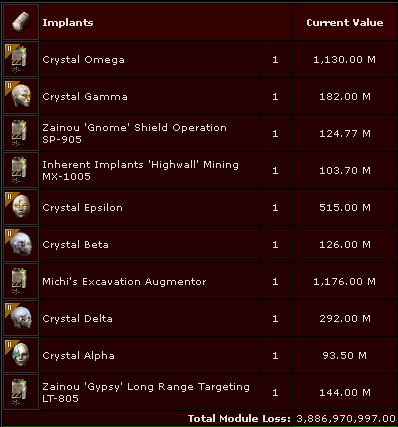 Leticronn's Raven Navy Issue was worth 5.6 billion isk before it was converted into a killmail by Agents Arden Elenduil, Zkanu, popblues420420, Fen Haroun, Tah'ris Khlador, James Everett, Amyclas Amatin, and Perseus Parker. You could throw a few hundred pilots into a battle in nullsec and not do that much damage! Leticronn just wanted to "run some missions". Yeah, you can run missions in highsec all you like. You can run, but you can't hide, from the Code. It turns my stomach to say this, but there was a lot of competition in this category. 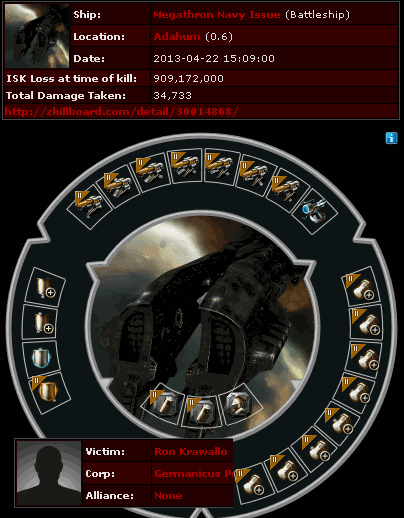 The "winner" was Ron Krawallo's 909 million isk mining Megathron Navy Issue. Agents Ziaeon, Fawn Tailor, Dante Lobos, Lenda Shinhwa, Galaxy Pig, Selina Dyle, and Galaxy Chicken got justice for highsec by putting the creature out of its misery. I'd like to meet the rebel who can justify the existence of such a vessel, or who can honestly object to its death. It's a crime for a faction battleship to spend its days humiliated and shackled to mining lasers, and enslaved in the ore belts. Our Agents set it free. Highsec has been improved immeasurably over the last year, thanks to the good men and women of the New Order. I wonder what kills we'll see this year? Though not nearly as expensive as some of the Orca ships they would go on to kill later it seemed like a landmark kill at the time, and remains one of my favourite articles to this day.